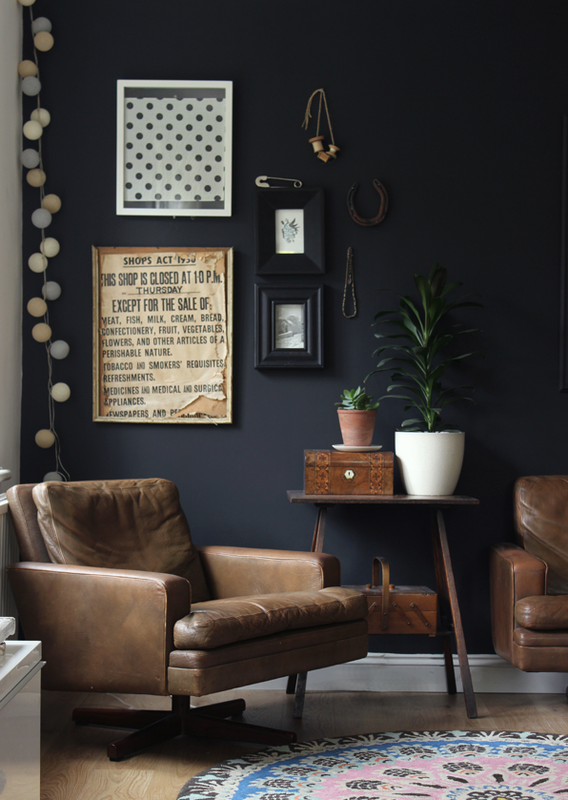 Heather Young runs successful blog Growing Spaces, documenting how she is creating a stylish family home that suits her, her husband, and her young twins. 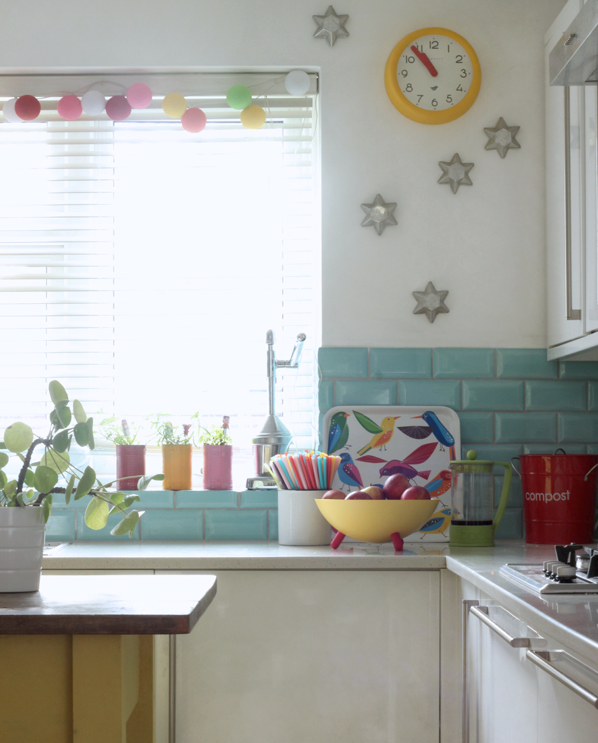 We caught up with her to ask how she’s done it – and to get her top five tips for creating a kid-friendly home with a sense of style. – Why did you set up your Growing Spaces? I set up a the blog in 2009 just after my twins were born. 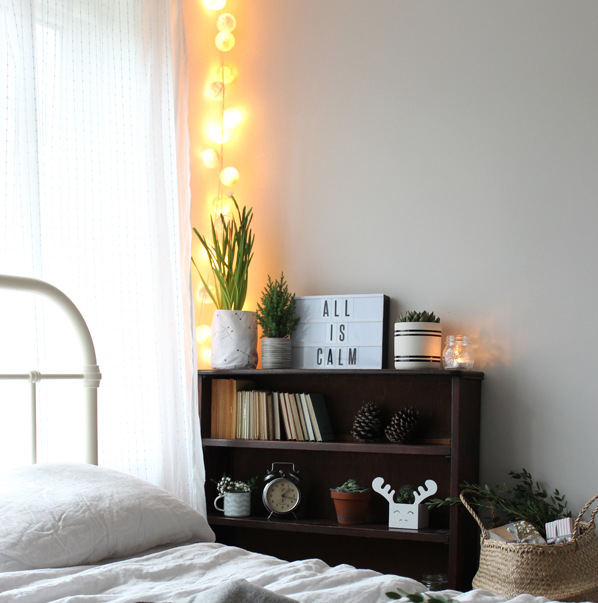 Originally I planned just to blog about how we were turning our very dated 1970s house into a modern family home, but I very quickly branched out and now Growing Spaces covers our own DIY projects, as well as styling ideas, things that inspire me, and travel, craft and fashion, too. – How has your interiors style changed since having the twins? 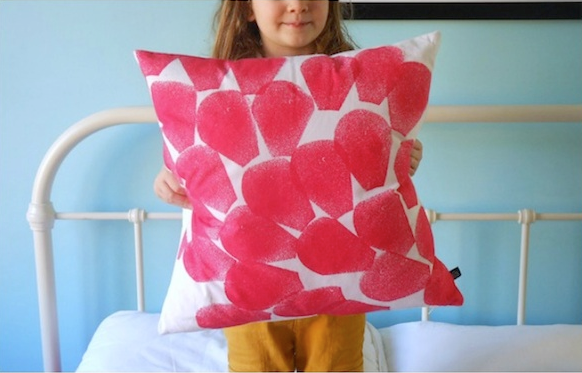 Before having kids we opted for a very pared-back, neutral palette – soft greys with lots of white and silver, but with the influx of bright kids’ toys and general paraphernalia, I decided to embrace colour when decorating our new home. However, over the last year I’ve found myself slowly limiting the colour again and we’re back to whites and greys, but with a couple of accent colours (soft turquoise and yellow) thrown into the mix. I’ve always loved vintage pieces, and have a lot of furniture from my grandparents’ old house, and I’m a sucker for a junk shop or a car boot sale. – How have you decorated the twins’ rooms? I chose a penguin classics theme for their nursery because I liked the bright colours, and it was a theme they wouldn’t grow out of. Last year we decided it was time for them to have their own rooms. I got them to choose their favourite colour (or two), and then I had the freedom to create something that would suit their personalities, based on the colours they’d chosen. I wanted to incorporate plywood in both the rooms – it’s a great, inexpensive material with a contemporary look. 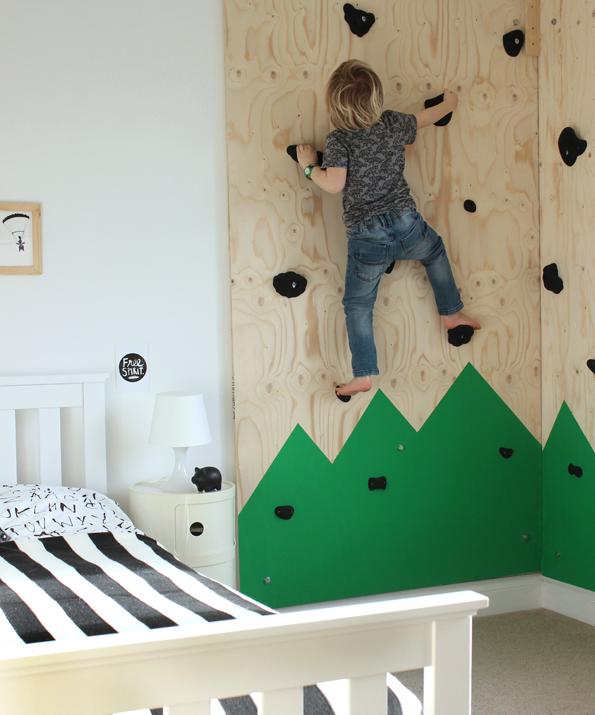 I had the mad idea of creating an indoor climbing wall in my son Alfie’s bedroom. My husband thought I was bonkers, but luckily he’s great at DIY so he could build it for me. My daughter Esme loves colouring and writing, so a desk was a must for her. We bought some white basic furniture from Ikea, and clad it in the plywood to give it a more pulled-together, built-in look. – Do you have one room in the house that’s a sanctuary? I love spending time in my office. I pulled up the carpet and painted the concrete floor white, treated myself to a set of Pocket String shelves and my husband built me a simple desk out of some of the plywood. It’s a lovely bright room, and I’m most likely to be found in there catching up on some blog reading if I’ve managed to sneak away. 1 – Create a flexible layout. I’ve lost count of the number of times we’ve changed the configuration of our downstairs living space to suit whatever stage the twins are at. 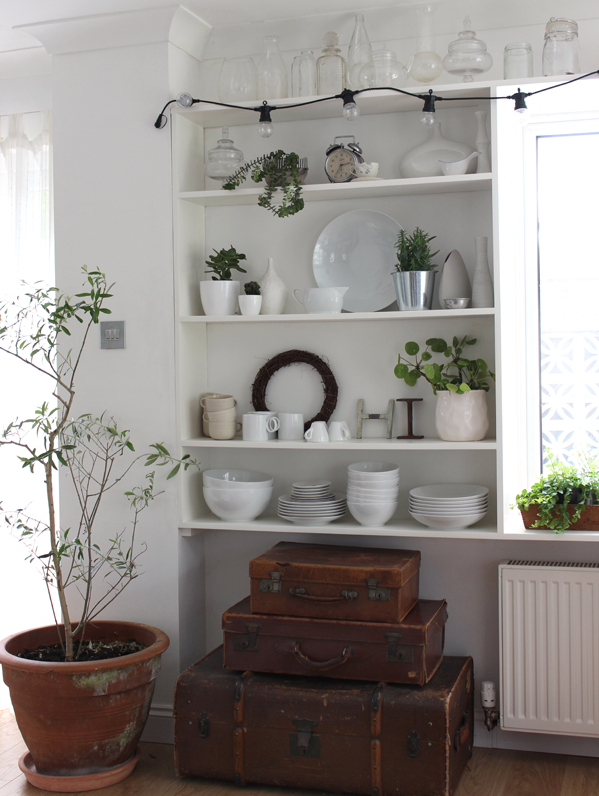 It’s a good thing that I quite enjoy moving things around – I always think it gives a room a new lease of life. 2 – Pick practical furniture. We have to be realistic with our furniture choices – there’s no point splashing out on a blow-the-budget piece of furniture if I know it won’t stand up to the rigours of two energetic six-year-olds. More often than not you’ll find me upcycling an older piece instead of buying something new. 3 – Don’t be too precious. While I don’t advocate letting them trash the place, I do firmly believe that the kids should be allowed to express themselves at home – our house is a family home, not an everything-is-perfect showhome, and I wouldn’t want them to have to tiptoe around the place, worried about breaking stuff. 4 – Plan in lots of storage. I know everyone says it, but good storage is a must when you’re living with children. As much as you try to keep on top of the stuff, there always seems to be too much of it, so I like to keep it contained in cupboards or chests as much as I can. 5 – Get a shed! If you’re lucky enough to have space for a playhouse in the garden, you can put the most visually offensive items in there!For more colourful ideas for kid’s rooms check out our shutter gallery, or visit our Kids’ Rooms & Nurserys Pinterest board.